A couple days after the FBI blamed the Sony hack on North Korea, that country went offline. Many suspected the U.S. government, but the reality is that anybody can do it -- even you. 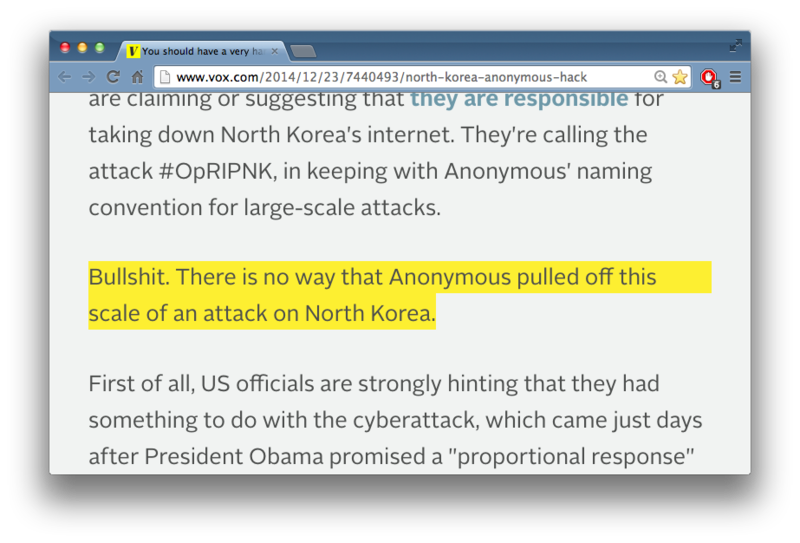 I mention this because of a Vox.com story that claims "There is no way that Anonymous pulled off this scale of an attack on North Korea". That's laughably wrong, overestimating the scale of North Korea's Internet connection, and underestimating the scale of Anonymous's capabilities. North Korea has a roughly ~10-gbps link to the Internet for it's IP addresses. That's only about ten times what Google fiber provides. In other words, 10 American households can have as much bandwidth as the entire country. Anonymous's capabilities exceed this, scaling past 1-terabit/second, or a hundred times more than needed to take down North Korea. Attacks are made easier due to amplifiers on the Internet, which can increase the level of traffic by about 100 times. Thus, in order to overload a 10-gbps link of your target, you only need a 100-mbps link yourself. This is well within the capabilities of a single person. Such attacks are difficult to do from your home, because your network connection is asymmetric. A 100-mbps from Comcast refers to the download speed -- it's only about 20-mbps in the other direction. You'll probably need to use web host services that sell high upload speed. You can cheaply get a 100-mbps or even 1-gbps upload connection for about $30 per month in bitcoin. You'll need to find one that doesn't do egress filtering, because you'll be spoofing North Korea's addresses, but that's rarely a problem. You need some familiarity with command-line tools. In this age of iPads, the command-line seems like Dark Magic to some people, but it's something all computer geeks use regularly. Thus, to do these attacks, you'll need some basic geek skills, but they are something that can be acquired in a week. How I would do it is roughly shown by the following command-line command. This uses some software I wrote for port-scanning, but as a side effect, it can also be used for these sorts of "amplified DDoS" attacks. For this attack to work, you'll need a list of amplifiers. You can find these lists in hacker forums, or you can just find the amplifiers yourself using masscan (after all, that's what port scanners are supposed to do). I use masscan in my example because it's my tool, so it's how I'd do it, but no special tool is needed. You can write you own code to do it pretty easily, and there are tons of other tools that can be configured to do this. I stress this because people have this belief in the power of cyberweapons, that powerful effects like disabling a country can't happen without powerful weapons. This belief is nonsense. It's unknown if Anonymous hackers actually DDoSed North Korea, like the "Lizard Squad" that claims responsibility, but it's easily within their capabilities. What's actually astonishing is that since millions of people can so easily DDoS North Korea why it doesn't happen more often. Note: This only takes down one aspect of the North Korean Internet. Satellite links, other telephony links, cell phones, and the ".kp" domain names would still be unaffected. It would take some skill to attack all those possibilities, but it appears that the hackers only did the simple DDoS. Did you mean "Lizard Squad"? I was wondering, how did you arrive to the conclusion of DPRK's total maximum network bandwidth?